Hello Deli: Midge (Rachel Brosnahan) and Susie (Alex Borstein) nosh and schmooze in Season 2 of Amazon's The Marvelous Mrs. Maisel. It's been over a year since Amazon dropped the first season of The Marvelous Mrs. Maisel, its comedy series about a 1950s well-to-do Upper West Side housewife-turned-standup-comic navigating the beginning of a showbiz career. Produced, (mostly) directed and (largely) written by Amy Sherman-Palladino and Daniel Palladino, the team behind Gilmore Girls and Bunheads, that first season burst fully formed from the forehead of Zeus (read: the top hat of Sherman-Palladino). It was breezy, funny, exquisitely made (the locations! the sets! the costumes!) and fueled by its fast-talking central character's supreme — and, we swiftly learned, entirely justified — confidence in herself. It was something, that self-assuredness: Tireless, for one thing. Admirable, surely. Charming, often. But from a dramatic perspective, dicey. We like underdog stories. And, sure, on paper Midge Maisel (Rachel Brosnahan) has her work cut out for her. She's trying to make a go of it as a professional female comedian in a time and place constructed to prevent that from happening. Plus, her marriage fell apart, she's got kids to look after, and her parents are her parents. Throwing so many obstacles in her path is a good way to get us to root for her, right? But the Palladinos are making a comedy, and historically they've tended to keep things so breezy that any serious obstacles in their protagonists' path get caught in a wind gust and vanish. And then there's Midge herself, who's set out on a difficult path, beset by institutional sexism that forces her to work four times as hard as her male comedian colleagues. Yet everything continues to come easy for her, and everyone around her (including but not limited to Lenny Bruce) keeps telling her how special, hilarious and ... not to put too fine a point on it ... marvelous she is. She tends to agree. "I'm amazing," she says, often, to anyone who asks her how she manages to do whatever wonderful thing she's done, is doing, or is about to do. Those who've followed the Palladinos work for years will recognize all the troubling symptoms of Rory Gilmore Exceptionalism Syndrome (RGES), wherein a character's privilege gets compounded by having other characters continually inform viewers of her wondrous qualities, despite a dearth of empirical evidence for their existence. You'd be forgiven for wondering, then, if the year-and-change that passed between seasons 1 and 2 would have served to worsen Midge's case of RGES, given that The Marvelous Mrs. Maisel's debut season was such a critical and popular success. I'm happy to report that, despite glowing reviews, fervid word-of-mouth, eight Emmys, a Golden Globe and a frickin' Peabody Award, Midge Maisel's RGES has not experienced a serious outbreak; it remains a chronic, but treatable, condition. One: Rachel Brosnahan has got the goods. We believe Midge Maisel worthy of the praise she receives from others and gives to herself because Brosnahan is so good at inhabiting a character who's confident but not arrogant, assured but not smug, ambitious but not grasping. As ever, she's called upon to deliver long streams of dialogue at a pace that rivals a Sondheim patter-song, and does so with unerring precision. Two: Midge's privilege is no longer Maisel's winking subtext — it's the explicit theme of Season 2. In Season 1, the fact that Midge had a perfect life — at least by the normative standards of 1950s America — represented the Eden she'd been cast out of, never to return. Except ... she did return, often. Because she could. She moved fluidly between Upper West Side calisthenics classes and downtown coffee club culture because she retained the means to do so. Happily, Season 2 isn't content to treat that fluidity as a given, and sets out to unpack its implications. 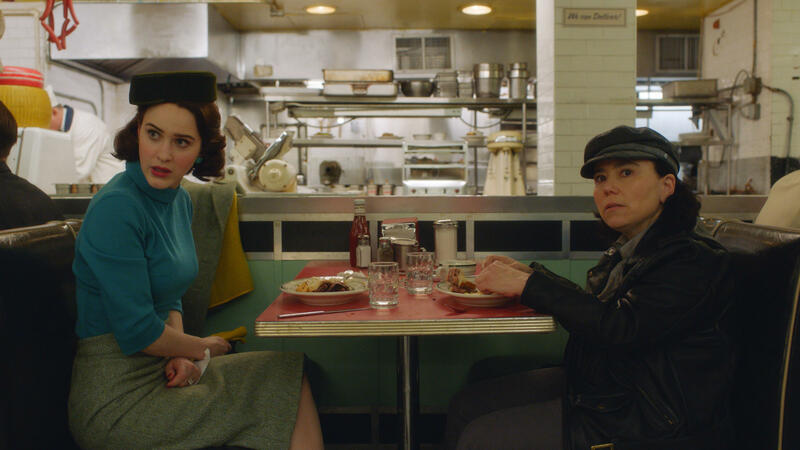 Maisel is always at its best when it's exposing Midge's blind spots, and that's particularly true in the case of her dealings with her manager Susie (Alex Borstein). Midge loves standup and is increasingly willing to do the work necessary to turn her natural, extemporaneous gifts into finely honed, road-tested material. Yet she remains reluctant to take the kind of real steps that might jeopardize her comfortable existence. Again and again we see her prioritizing her stable domestic life — her family, her job at a department store, her ability to take two-month vacations — over career opportunities in the world of comedy, to Susie's teeth-gnashing outrage. Both Brosnahan and Borstein won Emmys for their work in Season 1, and whenever the show grants them a scene together you're freshly reminded why. This season there's an extra energy to their interactions, as we see more of Susie's lonely, scraping-to-get-by existence, and Borstein lets an increasing sense of desperation leach into her performance. There's a real tension in her, as envy and admiration, rage and resentment, despair and exasperation roil in her gut, throttled by the prideful need to keep it together. Keeping it together, of course, is Midge's entire deal, and her inability to perceive her pampered lifestyle, along with her belief that she can keep her standup career hidden from her family and friends, is truly tested for the first time. It proves a crucial development for both the character and the series, as it deepens and complicates Midge's world in ways even her headstrong assertiveness can't easily fix. One concrete good thing that the success of Season 1 has netted the show is a bigger budget for shooting on location — the first two episodes see Midge and her parents Abe (Tony Shaloub) and Rose (Marin Hinkle) wandering the streets of Paris, which looks every bit as heart-stoppingly beautiful as intended. (The Paris sojourn gives Hinkle a chance to add much-needed layers to Rose's character, in funny, surprising ways.) Later, the family traipses up to a Catskills summer resort, where lush woods, a sparkling lake and a charming cottage await them — along with character actor Saul Rubinek and potential Midge love interest Zachary Levi. Mostly, though, The Marvelous Mrs. Maisel Season 2 provides the same delights Season 1 provided — crisp banter, zingy one-liners, characters you care about, costumes you marvel at, and terrific, if not strictly chronologically appropriate, music supervision (the opening montage set to Barbra Streisand belting "Just Leave Everything to Me" from the 1969 film Hello, Dolly! is more than just a great choice — it's the show's mission statement). But its willingness to address the yawning divide between Midge's life and Susie's — and to actually challenge Midge in ways that even her enormous reserves of nerve and witty patter can't easily overcome — makes the show that much richer, smarter and even more satisfying.